Located, west side on Victoria Road, east side visible from Caroline Street. Work began on the mill complex in 1851 and it was officially opened in 1853, on Titus Salt’s 50th birthday. Designed by Lockwood and Mawson in the Italianate style, the building was intentionally impressive and was known as ‘The Palace ofIndustry’. Fairbairn, who was an eminent civil engineer, executed the mil lconstruction and engineering. The main frontage of the mill was designed to face the railway, and it was clearly intended to be an important advertisement for the firm. Lockwood and Mawson’s first design for the mill, costed at £100,000, was rejected by Salt as being ‘not half large enough’. Robert Balgarnie (1877) reports that Lockwood was to deduce that money would not be an issue provided the work was carried out efficiently and that the mill should provide ‘ventilation, convenience and general comfort’. He continues, ‘Hitherto,manufactories had been built with little regard to such conditions, and as for the buildings themselves, there was a decided lack of architectural taste in them. But the manufactory now proposed was to be,externally, a symmetrical building, beautiful to look at, and, internally, complete with all the appliances that science and wealth could command’. The finished building was described as being ‘...constructed of massive stonework in the boldest style of Italian architecture. The walls look more like those of a fortified town than of a building destined to the peaceful pursuits of commerce’. Salts Mill south elevation as seen from Victoria Road. The visual appearance of the mill is unaltered apart from the blinds at the windows, used to moderate light into spaces now used as galleries, retail, restaurants and offices. Electrification of the railway line which runs beside the mil lhas been achieved with minimal detrimental effect to the mill. Salts Mill, as seen from the west side, Victoria Road. The whole structure was built of stone externally, with a brick and cast iron internal framework to minimise the risk of fire. It was fitted with two of Fairbairn’s beam engines, generating 1250 horsepower, with 10 subterranean boilers, underground shafting, upright shafting and belting. The vast subterranean reservoir was partly fed by rain water and supplied the boilers and beam engines. The drive shafts and other elements of machinery were located under the floor to reduce the risk of industrial injury. This outstanding example of planned integration enabled almost the whole of the worsted production process to be executed economically under one roof. The entire complex was constructed in warm coloured local sandstone, hammer-dressed with ashlar and rock-faced dressings,with red brick lining, a hipped Welsh slate roof and deeply bracketed cornice.The entrance and office block to the complex on Victoria Road has two storeys with a basement level at the left due to the sloping ground. The frontage facade comprises a symmetrical arrangement of 20 bays with two symmetrically placed projecting bays. The frontispiece of three bays has a giant portal with round-arched head extending into the first storey and is surmounted by a tall turret with a segmental pediment and flanking scrolls. To each side of the portal is a three-light canted bay with round-arched centre light. The ground floor windows are round-arched with rusticated voussoirs,whilst the first floor windows have cambered heads.The railings and piers (Listed Grade II),which were probably also designed by Lockwood and Mawson, were erected between 1860 and 1870. The main mill building has four storeys with a basement in a T-shaped plan, with lower sheds in the angles and extending to the east. The south facade is 166 metres in length and 22 metres high, comprising 60 bays arranged symmetrically, with a pair of centrally-placed projecting bays with round-headed openings on the ground floor. Two square attached towers, also symmetrically placed either side of the projecting bays, project above the eaves, pierced by pairs of round-arched openings. They are capped with hipped roofs. The main facade is terminated at the west and east ends by projecting bays.The three upper floors of the facade are punctuated with cambered-headed windows linked by string courses at cill level, whilst the ground floor windows are round-arched with rusticated rock-faced voussoirs, also linked by a similar string course. A deep bracketed eaves cornice caps the whole composition. A parapet links the central bays and towers.The roof structure was of an advanced design, with cast iron struts with wrought iron rods that, unlike the floors below, did not require decorative cast iron columns for support. The resultant huge undivided space was considered to be the largest ‘room’in the world at that time. The dramatic mill chimney (Listed Grade II) dominates the main facade, which is freestanding and offset to the eastern end of the facade. The chimney stands 68 metres high and is built of hammer-dressed stone. It tapers upwards from a square base, which has rusticated quoins and a cornice on large square brackets. The upper part of the chimney is plain, with only slit-like recesses.The extensive single storey sheds have round-arched windows, segmental-headed cart-entries and a deep parapet. The rear elevation has three gables, each with semi-circular window. The left elevation has five tall panels with altered windows and corniced heads. Later additions are found to the right elevationand at the rear. 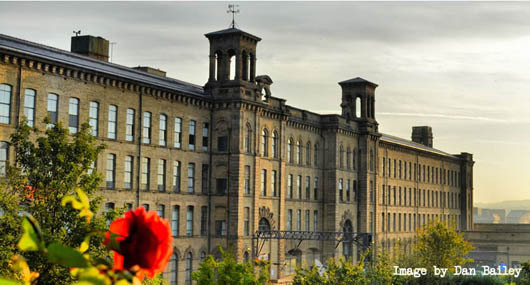 Salts Mill has undergone restoration and the partitioning of the original large workspaces to convert the old mill into economically viable uses. All partitioning is reversible. Around 70% of the roof has been replaced, the building is generally in good structural condition. The multi-million pound investment has come exclusively from private sources. The building is now occupied by a mixture of retail and manufacturing uses.